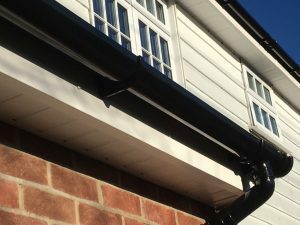 Soffits, fascias and guttering all play an important part in keeping your home pest free and dry. They are highly important from an aesthetic point of view too. Having clean and tidy guttering makes your home look far more attractive and appealing to buyers. If you are thinking of selling your home, then tidying up the outside of your house is a good idea. Replacing your guttering including the soffits and fascias that are old wooden or worn helps to protect your roof and walls immensely. In turn, preventing damp and water damage to your home. Clean new gutters and fascias can greatly increase the value of your home and will impress the surveyor at the same time. A soffit is the covering which sits between the outer edges of your roof and the adjacent wall of the home, protecting and sealing the rafters. If your roof has a soffit (not every house does!) you will be able to see it if you stand underneath the overhang of your roof and look upwards. The purpose of a Fascia is to protect and seal the roof and the interior of your home, from exposure to the outside elements. They also support roof tiles at ‘eave’ level and provide support for the guttering. Guttering is used to gather rainwater from the roof and direct the flow of water as it drains. The gutter catches the water and send it into the downpipes, and then towards a drain. Guttering is fixed with the appropriate level to prevent the water from pooling in places that it should not, which could over time lead to your gutters overflowing, which is then likely to give you many problems. Modern soffits are usually made of UPVC. These are hardwearing and durable, able to cope well with exposure to moisture. Fascias were traditionally a softwood board, mounted on the outside edges of your rafters, in recent years this has been replaced with high-grade UPVC, as softwood has the tendency to rot!